Moon Hunters is an odd beast of a game, in that the story is driven home with repeated playthroughs and only playing the game multiple times will you fully grasp the plot. 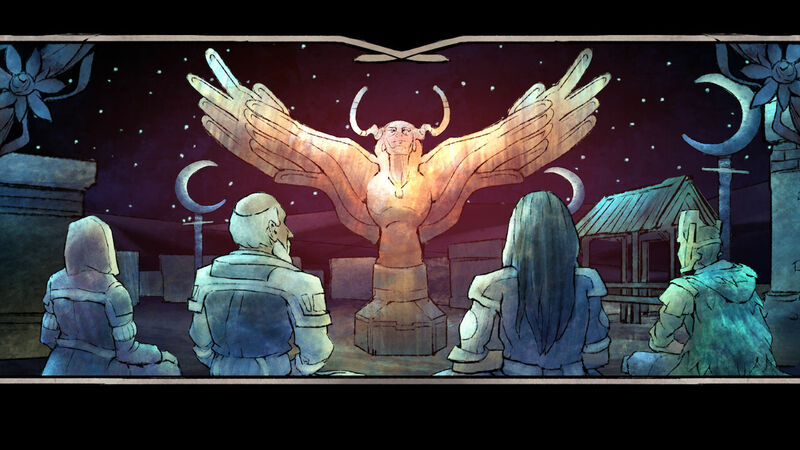 Before I get onto the actual game and how it plays, it’s worth noting that Moon Hunters features a deep world of folklore and mythology which completely envelops the player. It’s as deep as you want it to be, because all of the story is released in chunks and could be skipped should you choose. And to be honest the story is the strongest aspect of the title. The game is very reminiscent of Dungeons and Dragons; race and homeland is picked at the start of an adventure which decides the base stats of your character. Throughout the adventure certain actions will alter those stats plus add certain traits which tweak the way situations play out. When the game ends, the player is given a brief life story run down which depicts what happened over their journey and fills in blanks of the overarching plot. This then is transferred to the “lobby” area of the game in the form of statues. Choosing different builds equals a different take on the story. So, players who want to ‘complete’ the story will find many hours of play and will have built a tale featuring characters they’ve named, created and used to change paths in the world. Moon Hunters does fall a little short in terms of actual gameplay, though. For a game that requires you to play over and over again, the mechanics are far too repetitive. While differences in character race changes their abilities and these can then be upgraded, they each play quite similarly. There’s either distance attacking or hack and slash styles, most characters have a dashing or spacing move to get out of harm’s way swiftly and an area of attack action. This often means that fights can be tiresome because there’s little variation in each battle. Thankfully, Moon Hunters is randomly generated so the worlds you explore will change and alter and there are plenty of features to unlock such as new playable characters and familiars that accompany your avatar. The most interesting feature is the changing of stats and traits; exploring that dark cave could make your character brave, but drinking the unlabelled potion will lead you to feeling foolish. When making camp at the end of each area – the game takes place over three days, this can’t be changed and ensures that each playthrough takes around an hour – you can choose what to do in camp, which will boost certain combinations of stats, but could also lead to debuffs if you choose poorly. Moon Hunters is easily summed up by saying it’s akin to a Dungeons and Dragons-style “choose your own adventure”. Some choices you make can play out very differently with your third, sixth, or twentieth playthrough. Every tale has the same start and end, but the middle can be incredibly varied. It’s a sumptuous title in both story and presentation; with visuals that could stand up next to Hyper Light Drifter and sound design that sweeps through orchestral themes and folk songs. It’s a shame that the fighting mechanics feel a little too similar because the story itself is a real treat.